Brooklyn based, Art House Co-op wants you to explore your artistic side by contributing a piece of art to a traveling exhibition that can be viewed across the United States. Called the Sketchbook Project, you can submit a scrapbook, a journal, a map, a puzzle, a sculpture, a story—with the Project anything goes. What kind of growing pains did you experience? We’ve had to solve some tricky logistical problems: how do you safely transport more than 3,000 pounds of books across nearly 18,000 miles? And we’ve had to figure out how to send and receive thousands and thousands of packages through the mail. Each new challenge has better prepared us for the next one. 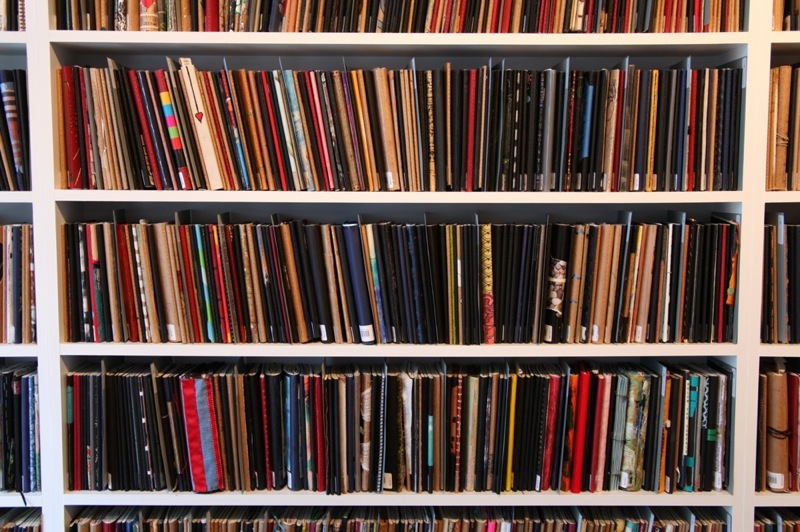 A sample of the Sketchbook library. What upcoming events are planned this summer? We’ll be completing the 2011 Sketchbook Project Tour with dates in Seattle (June 10-12), San Francisco (June 16-18), Chicago (July 14-17), and Florida (July 29-31). We’re also planning a special event at the Brooklyn Art Library to welcome the collection back home at the end of the summer. Perhaps most exciting of all: we’ve launched the 2012 Sketchbook Project with plans for a world tour. Where would you like to see art house/sketchbook in the future?